When it was time to get a dog, Eve was leaning towards a Great Dane. She loved their majestic beauty and temperament. Cathy, a good friend of mine, heard of Eves search. She invited us over to visit her and Koda, her Anatolian. It didnt take Eve long to realize that this was the breed for her. 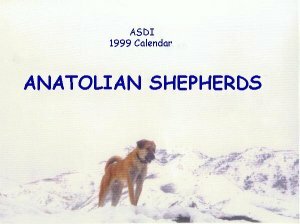 Cathy went to work searching for puppies, and found what was to be Eves Anatolian. After much correspondence with this young dogs owner, the 8-month old male was flown from Ohio to Eve in Salt Lake City, Utah. When the enormous dog kennel was taken out of the plane and brought to us, we werent quite sure what to expect. Cathy opened the kennel door, and we waited for him to appear...and waited...and waited! Finally, we coaxed him into the light and saw a shy, but beautiful creation. Eve knew instinctively that she was looking at a large part of her heart. Sair adapted to his new home and new mom with great ease. Sure, he chewed up a few (hundred) things, and comes when he is called IF he is ready to come, but dont we all have our faults? Everyone who knows these two is amazed at their similar personalities; they were meant for each other. Eve has given Sair a wonderful, loving home, and Sair has shown Eve a new dimension of love that didnt exist before he flew into her life. She still thinks that Great Danes are magnificent animals, but come now, what can compare to her ANATOLIAN!